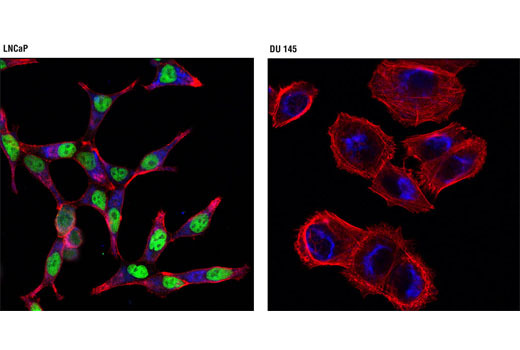 Confocal immunofluorescent analysis of LNCaP (left) and DU 145 (right) cells using Androgen Receptor (D6F11) XP® Rabbit mAb (Alexa Fluor® 488 Conjugate) (green) and Hexokinase I (C35C4) Rabbit mAb (Alexa Fluor® 647 Conjugate) #3540 (blue pseudocolor). Actin filaments were labeled with DY-554 phalloidin (red). Flow cytometric analysis of Jurkat cells (blue) and LNCap cells (green) using Androgen Receptor (D6F11) XP® Rabbit mAb (Alexa Fluor® 488 Conjugate) (solid lines) or a concentration-matched Rabbit (DA1E) mAb IgG XP® Isotype Control (Alexa Fluor® 488 Conjugate) #2975 (dashed lines). Blocking Buffer (1X PBS / 5% normal goat serum (#5425) / 0.3% Triton™ X-100): To prepare 10 ml: add 0.5 ml normal goat serum and 0.5 ml 20X PBS to 9.0 ml dH2O, mix. While stirring, add 30 µl Triton™ X-100. Antibody Dilution Buffer: (1X PBS / 1% BSA / 0.3% Triton™ X-100): To prepare 10 ml, add 30 µl Triton™ X-100 to 10 ml 1X PBS. Mix well then add 0.1 g BSA (#9998), mix. NOTE: Cells should be grown, treated, fixed and stained directly in multi-well plates, chamber slides or on coverslips. Aspirate liquid, then cover cells to a depth of 2–3 mm with 4% formaldehyde diluted in 1X PBS. Allow cells to fix for 15 min at room temperature. Aspirate fixative, rinse three times in 1X PBS for 5 min each. Block specimen in Blocking Buffer for 60 min. Rinse three times in 1X PBS for 5 min each. Coverslip slides with Prolong® Gold Antifade Reagent (#9071) or Prolong® Gold Antifade Reagent with DAPI (#8961). For best results, allow mountant to cure overnight at room temperature. For long-term storage, store slides flat at 4°C protected from light. Resuspend cells in 100 µl of diluted antibody conjugate (prepared in incubation buffer at the recommended dilution). Incubate for 1 hr at room temperature. Protect from light. Supplied in PBS (pH 7.2), less than 0.1% sodium azide and 2 mg/ml BSA. Store at 4°C. Do not aliquot the antibody. Protect from light. Do not freeze. 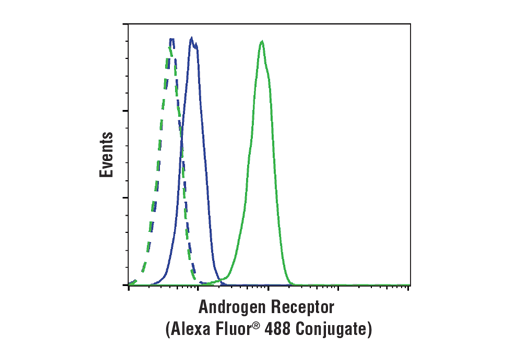 Androgen Receptor (D6F11) XP® Rabbit mAb (Alexa Fluor® 488 Conjugate) detects endogenous levels of total androgen receptor protein. Monoclonal antibody is produced by immunizing animals with a recombinant protein corresponding to residues near the amino terminal region of human androgen receptor protein. This Cell Signaling Technology antibody is conjugated to Alexa Fluor® 488 fluorescent dye and tested in-house for direct flow cytometry and immunofluorescent analysis in human cells. The antibody is expected to exhibit the same species cross-reactivity as the unconjugated Androgen Receptor (D6F11) XP® Rabbit mAb #5153. Androgen receptor (AR), a zinc finger transcription factor belonging to the nuclear receptor superfamily, is activated by phosphorylation and dimerization upon ligand binding (1). This promotes nuclear localization and binding of AR to androgen response elements in androgen target genes. Research studies have shown that AR plays a crucial role in several stages of male development and the progression of prostate cancer (2,3). Li, J. and Al-Azzawi, F. (2009) Maturitas 63, 142-8. Avila, D.M. et al. (2010) J Steroid Biochem Mol Biol 76, 135-42. Montgomery, J.S. et al. (2001) J Pathol 195, 138-46. The Alexa Fluor dye antibody conjugates in this product are sold under license from Life Technologies Corporation for research use only, except for use in combination with DNA microarrays. The Alexa Fluor® dyes (except for Alexa Fluor® 430 dye) are covered by pending and issued patents. Alexa Fluor® is a registered trademark of Molecular Probes, Inc.